She began a regular jazz column in 1970, published then in the Scottsdale Daily Progress, and in 1977 co-founded the non-profit organization Jazz in Arizona. Myers’ column continued through to 2017, at MusicSceneAZ.com, which featured her monthly jazz updates: her Riffs column, Events Calendar, and Jazz Venues. The website was conceived and is sponsored by the 104-year-old Professional Musicians Union, Local 586. It compiled all genres of music events throughout the state, with a special focus on local live jazz and Young Sounds of Arizona. 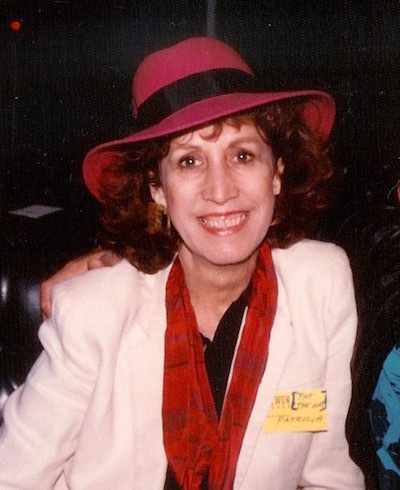 “Patricia was such a unique lady and she found a way to combine two of her greatest passions in life- music and writing”, says Jerry Donato, President of the Musician’s Union, who’s friendship with Patricia began back in the 1980’s. Patricia had an extensive body of work that spanned several decades and she never failed to intrigue her audiences. Over the years, Patricia developed friendships with local musicians and was well respected in the community as a writer and a supporter of live music. “Aside from supporting local music, Patricia truly cared about the artists. Her empathy for the elder artists was moving. She never forgot about them, even when they could no longer perform or were no longer in the public eye”, says Donato. And while it was evident that she cared deeply for the professional performers in our community, she had a special place in her heart for our Young Sounds members. She consistently promoted Young Sounds concerts, attended performances, wrote articles about our kids and spread the word about our scholarship opportunities. In 2016, she wrote, Young Sounds’ musicianship is amazing for their age-group, and they are always a pleasure to hear. It was as if she already knew how bright the future is going to be for our kids. Young Sounds Director Andrew Gross explains, “while we all know that Patricia was extremely passionate about live music and especially about jazz, we are both humbled and honored by her wishes to have donations made in her honor to our program. This means a great deal to our staff and to our kids and we are truly grateful”. Patricia loved the art of jazz and loved the artists, young and old alike, and for that we are grateful. And although her passing has left a hole in the heart of Young Sounds her spirit continues to remain with us all. Please join us is a Celebration of the Life of Patricia Myers – jazz journalist, organizer, producer, and bonne vivante – on Saturday April 1, from 1:00 pm to 5:00 pm, at the ASU Kerr Cultural Center in Scottsdale. Food and drink will be served. RSVP via email to RSVP@ASUKERR.com or at 480-596-2660. In lieu of flowers, donations are being accepted to the Patricia Myers Young Sounds Scholarship fund at www.youngsounds.org/donate and at the event.